Tech field එකේ ඉන්න ගොඩක් අය හොදට දන්න නමක් තමයි Ideamart කියන්නේ. Ideamart කියන නමට අලුත් අය ඉන්නවා නම්, ඒ අය වෙනුවෙන් තමයි මේ පරිච්චේදය වෙන් කරන්නේ. සරලවම කිව්වොත් Ideamart කියන්නේ dialog සමාගමෙන් හදුන්වාදීපු API management platform එකක්. මේක පටන් ගන්න කාලේ, ඒ කියන්නේ 2013 වගේ මේ platform එක use කරලා හදන applications Dialog පාරිභෝගිකයන්ට විතරයි භාවිතා කරන්න පුළුවන් වුනේ. එත් පස්සේ Hutch සමාගමත් මේකත් එක්ක එකතු වුනා. ඒ කියන්නේ අද වෙද්දී Hutch සහ Dialog යන අංශ දෙකේම පාරිභෝගිකයන් ඉලක්ක කරගෙන applications නිර්මාණය කිරීමේ හැකියාව තියෙනවා. ඒ වගේමයි software development ගැන වැඩියේ දැනුමක් නැති, එත් තමුන්ගේම කියල ව්‍යාපාරයක්(startup එකක්) ආරම්භ ගන්න කැමති අයටත්, Ideamart මගින් ඒ සිහිනය යථාර්තයක් කරගන්න පුළුවන්. Ideamart developer community එකේ ඉන්න developersල හරහා application හදාගන්න ඒ අයට අවස්ථාව තියෙනවා. විස්තර දැනගන්න පුළුවන් www.ideamart.lk කියන ලින්ක් එකට ගියොත්. නැත්නම් info@ideamart.lk කියන address එකට email එකක් දාන්න. 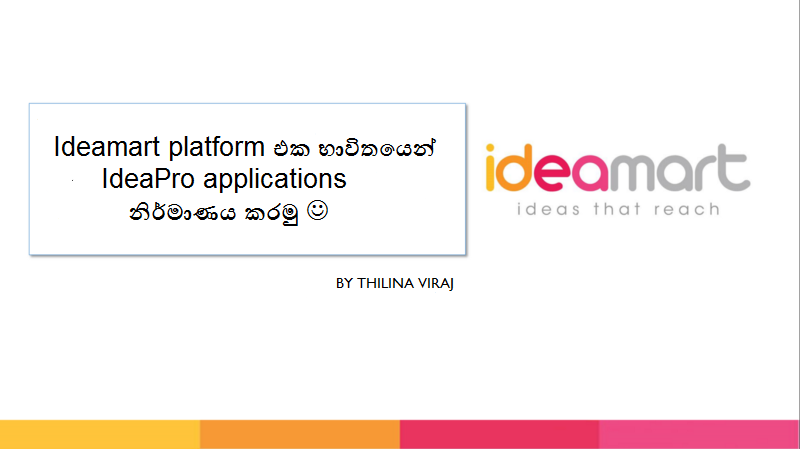 අද අපි කතා කරමු Ideamart තුල කොහොමද ඔබේ පලවෙනි IdeaPro application එක හදන්නේ කියල. ඔබේ පහසුව වෙනුවෙන්, ප්‍රධාන කොටස් 5ක් විදියට application එක create කරන විදිය පැහැදිලි කරනවා. 5. Application එක active production ගෙන test කරන්නේ මෙහෙමයි. App එක use කරන කෙනා, REG<හිස්තැනක්><keyword> (උදා : Jedi) කියල type කරලා 77100 ට SMS එකක් යවන්න ඕන. ඔබට ideamart එකේ applications නිර්මාණය කරන විදිය ගැන කියල දෙන්න, හදපු මේ app එක නොමිලේ භාවිතා කරන්න පුළුවන්. Subscribe වෙන්න REG<හිස්තැනක්>JEDI කියල 77100 ට sms එකක් යවන්න. Application එකෙන් message එකක් ගෙන්න ගන්න JEDI<හිස්තැනක්><ඔයාගේ නම> type කරලා 77100 sms කරන්න. මීළඟ පැහැදිලි කිරීම වෙනුවෙන් අවශ්‍ය වෙන broadcast message / whitelisted users කියල වචන දෙකේ තේරුම මෙතන පැහැදිලි කරන්නම්. Broadcast messages කියන්නේ, ඔයාට ඔයාගේ app එක use කරන subscribersල හැමෝටම එකම වෙලාවේදී යවන්න පුළුවන් message වලට. Whitelisted users කියන්නේ ඔයාගේ application එක භාවිතා කරන්න පුළුවන් usersලට. Application එක limited production තියෙනවා නම්, එක use කරන්න පුළුවන් whitelisted usersලට විතරයි. Broadcast message එකක් යවන්න නම් JEDI<හිස්තැනක්>GO<හිස්තැනක්>broadcast කරන්න ඕන message එක type කරලා 77100 ට sms එකක් යවන්න. Whitelisted users ලට පමණයි මේ application එකෙන් broadcast message එකක් දන්න පුළුවන්.